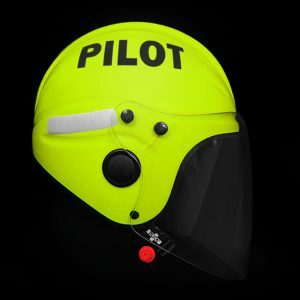 Our PAS 028 accredited maritime pilot helmets have been purpose designed for the marine environment with 316 grade stainless steel studs and a buoyant inflatable liner. The most popular helmet choice for maritime pilots is the open face helmet, which has been extensively tested for helicopter rescues where the rescuer jumps into water from a height of ten or more meters; the chamfered helmet edge and inflatable liner work together to prevent much water from entering the helmet and the grooves in the liner allow displacement of any water that does. 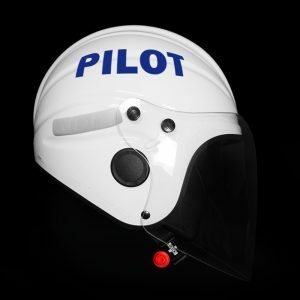 The retention system has enough elasticity in it to allow for some movement of the helmet as it hits the water without allowing the helmet to come off the head or injure the chin. Gecko marine safety helmets provide the maximum impact protection of any BSI helmet safety standard with 100 Joules of on crown impact energy absorption. The inflatable liners ensure that our helmets are warm and comfortable to wear all day as well as creating a 100% custom fit every time. 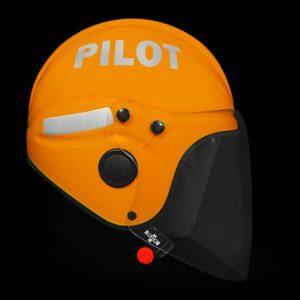 Gecko provides maritime pilot helmets to individuals and organisations all over the world, below are some examples of Gecko clients.